Please be advised that there is a shortage of rental cars during peak season. Verify that you can rent a car before you commit to reservations. Public transportation is limited in the area. There is a taxi system to get you to the Bonavista Peninsula, however, once on the Peninsula, there is no system to get you around the Peninsula. 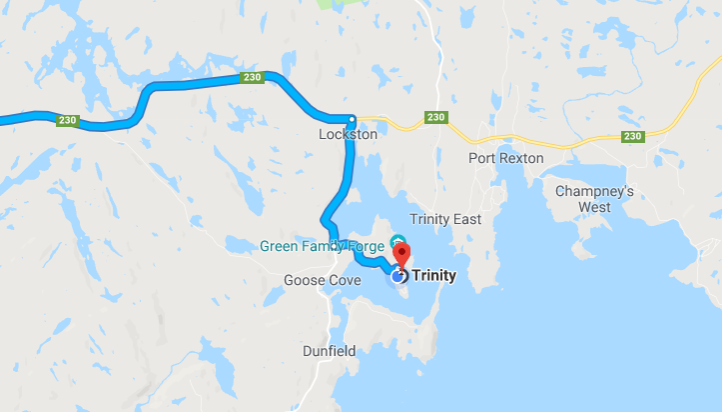 Please be advised that there are two towns of Trinity in Newfoundland. Our Trinity is located in the Eastern Region of Newfoundland and Labrador on the Bonavista Peninsula. This area is also known by its destination route name, The Discovery Trail. When searching online, please make sure you are searching TRINITY, TRINITY BAY. Drivers have the option of driving directly from Highway 1 to route 230 or they can cut through the town of Clarenville taking Route 230A that eventually meets up with Route 230. 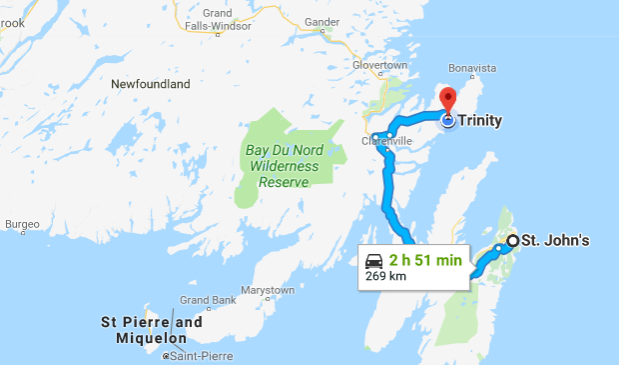 There is little difference in time between these two options, however, the second option is more scenic and more convenient if you plan to stop in Clarenville, which has larger grocery stores and a large NLC (Liquor Store) for supplies. 4. There is a left-hand turn after this bay that leads into the historic town of Trinity. Once you have reached the Royal Bank you will take a sharp hairpin right turn The Twine Loft is the second building on the right located behind a green building called the Barbour House. All guests must register at the Twine Loft (self-check-in is not an option for vacation homes) and our staff will bring you to your reserved room or house.